On board Regional Bahn RB15357 – 20 December 2010. Just days before Christmas, I took a regional train from Frankfurt am Main to Heidelberg. This regional route is slower but scenic, as the train makes stops at many points along the way through what is called the Bergstrasse. 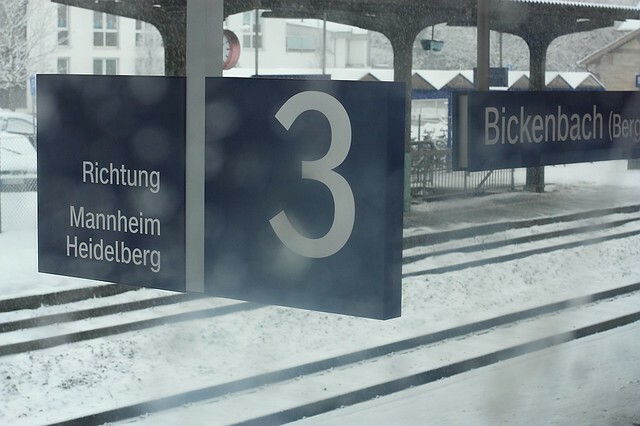 The sign below in Bickenbach for platform 3 indicates the direction (Richtung) and the next major destinations (Mannheim, Heidelberg) for trains that stop at this platform. 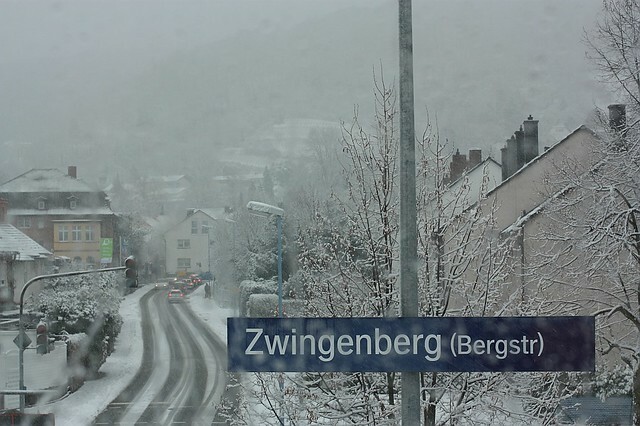 In the photograph below, the signage indicates the town where the train has stopped. Lurking behind the white winter snowy fog is the western edge of the Odenwald forest. This post is published originally on Fotoeins Fotopress (fotoeins.com).